I had a lot of Southwest Drink Coupons still to use up so I had an interesting twist on the mimosa that Southwest was offering....a cranapple mimosa. It was decent. We flew from Sacramento to Salt Lake City. We had a view of the Park City Mountain Resort from our balcony at the Doubletree Park City - The Yarrow hotel. However, as one can see, the snow conditions were less than optimal! Although we had an AWD SUV rental from SLC Airport, the hotel had a complimentary car service and shuttle that took us around town. 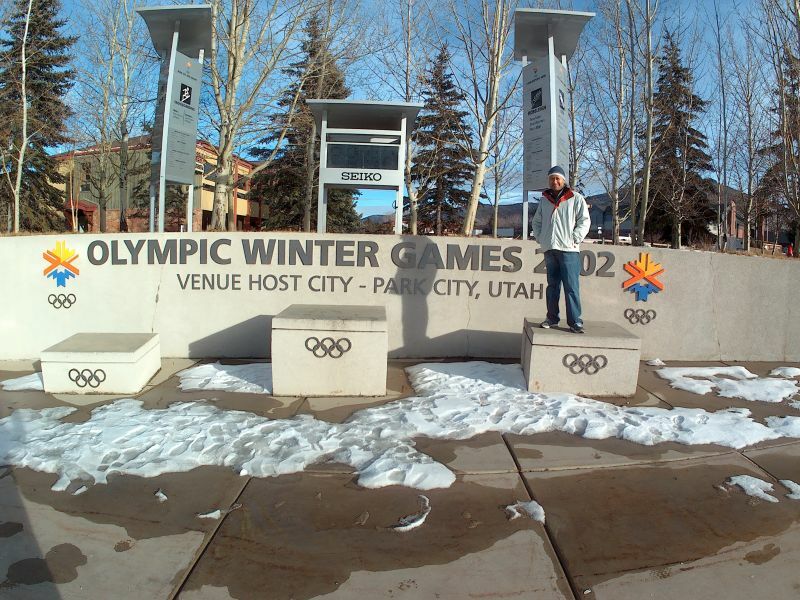 They had a nice park to honor the 2002 Olympic Winter Games which we were held in the Salt Lake City area including Park City. Joy wanted to go for the gold! 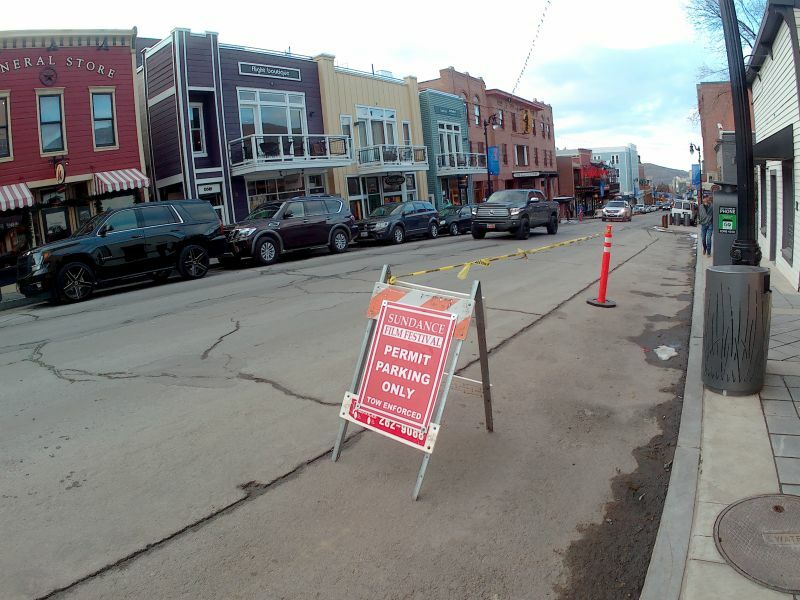 The Sundance Film Festival was going to start a few days after we visited Park City. This is the historic Main Street. We found a cool local coffee shop called Pink Elephant where I enjoyed a nice Americano. Here is a cool theater on Main Street in Park City. 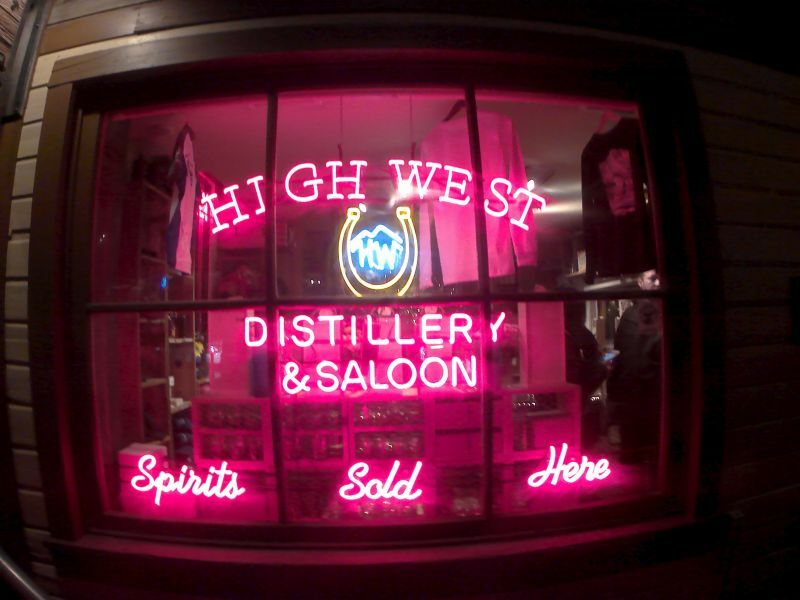 The High West Distillery is very famous in Park City. The wait for a table was over 2 hours! We even had a wait to go to the bar. I was able to do a whiskey tasting at the bar at High West. I bought a bottle of the American Prairie Bourbon for myself and one for my buddy. I am warming up by the fire at the hotel before heading out to do some cross country skiing. 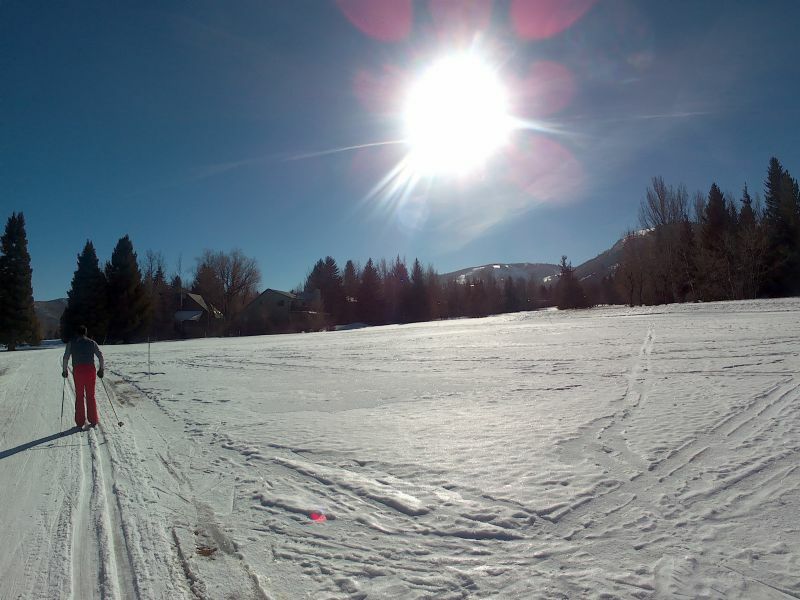 The hotel shuttle took us over to the White Pine Nordic Center for some cross country skiing. The snow conditions were not the best since it had not snowed in days. It was pretty icy also. The hot apple cider in the hotel lobby was great as we needed to warm up from the cold! There was a cool barn outside of Park City. The next great bobsled team for TEAM USA at the US Olympic Team Training Center in Park City is practicing. That is a ski jump ramp above us! These are examples of the medals that were awarded during the 2002 Winter Olympic Games. I think these were props used during the opening or closing ceremonies of the 2002 Winter Games. Temple Square in Salt Lake City was all lit up still. It looked really cool. We had dinner at the Rodizio Grill which is a Brazilian BBQ place in Trolley Square, a famous shopping mall in Salt Lake City. I got a nice shot of the Great Salt Lake from the plane as we were heading back home to Sacramento. Here is a nice picture I took from the air as we were approaching Boise from Sacramento on our way to Sun Valley for our annual President's Day Trip. We stayed in Elkhorn Village this time during our visit to Sun Valley. 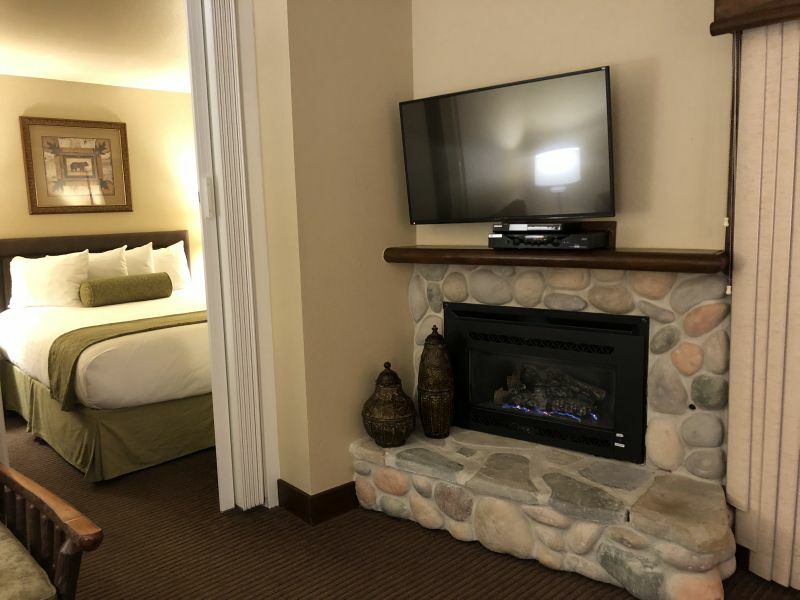 We rented a condo at Elkhorn Springs which was right next to the Dollar Mountain Ski Resort at Sun Valley, ID. The fireplace was nice since it was so cold outside! 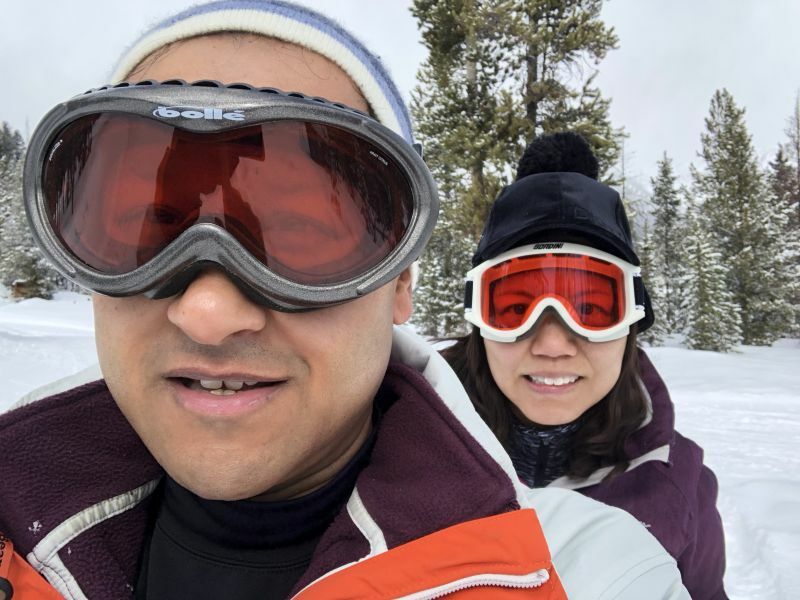 Joy and I had to drive up another thirty minutes or so to go to Galena to go snowshoeing since the snowfall was bad in Sun Valley also this year. The snowshoeing trail at Galena was really nice since they had a lot of snowfall up there. 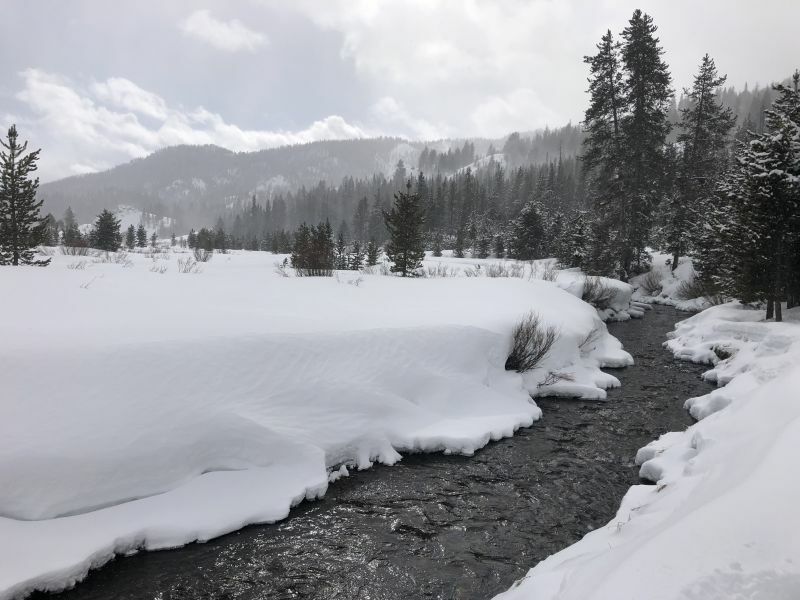 I love these streams that flow throughout the Idaho area in winter. 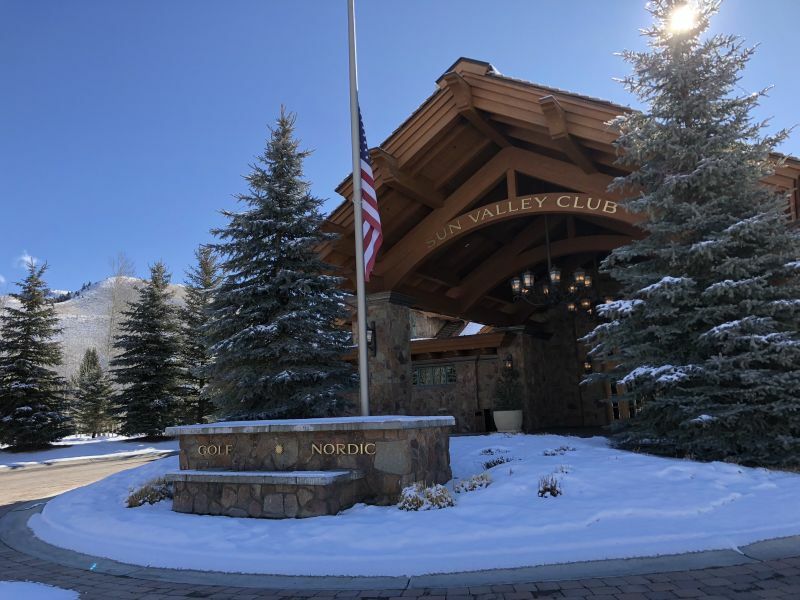 We returned to the Sun Valley Club after snowshoeing for lunch. We would have normally done both nordic skiing and snowshoeing here, but there was almost no snow on the ground. 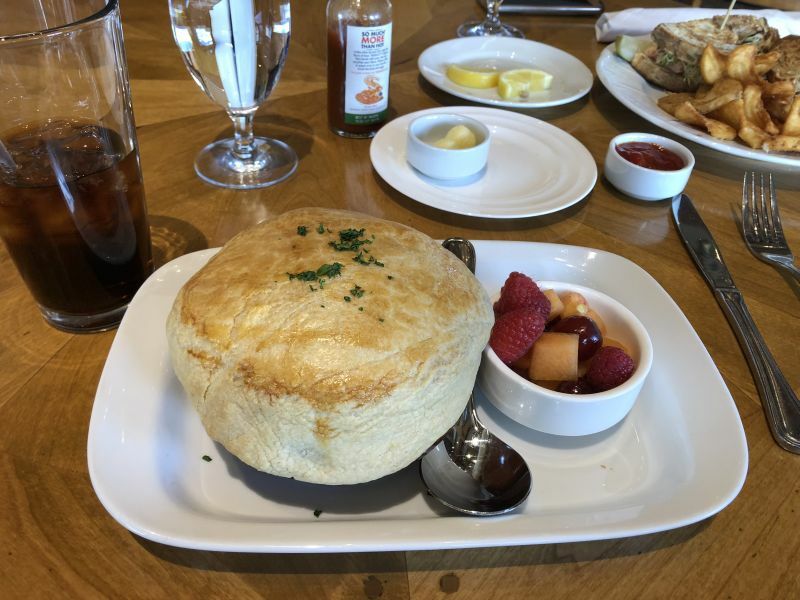 The food at the Sun Valley Club was so good as usual. 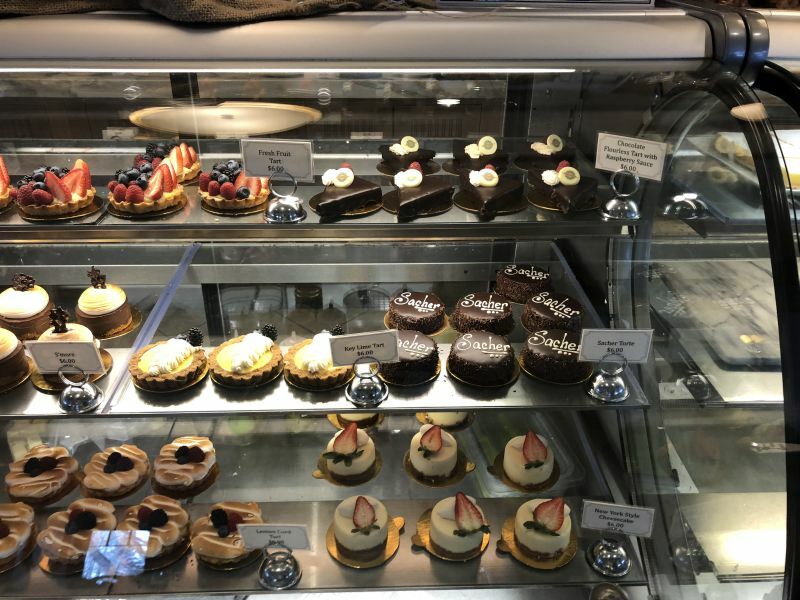 Joy and I had dessert at the Konditorei Bakery in Sun Valley after lunch. We had one of those S'Mores desserts. The next day, we had lunch at the Sun Valley Lodge. 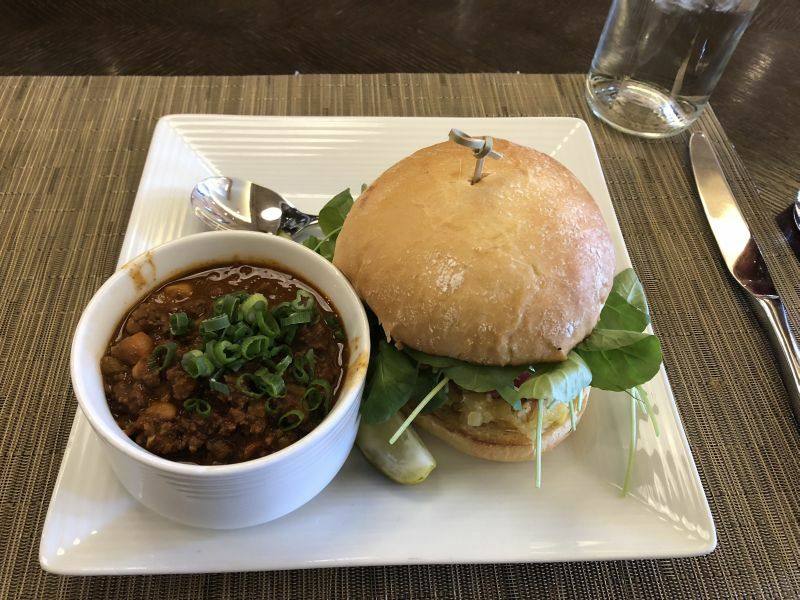 I had elk chili with an ahi tuna sandwich. The elk was amazing! Gotta love having a companion pass on Southwest Airlines. 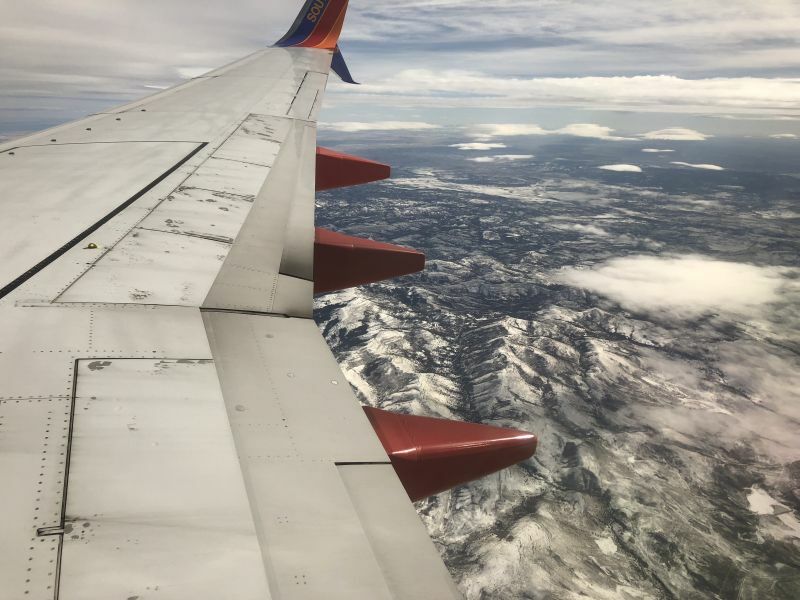 For 2018, Joy was able to fly for free with me on any flights operated by Southwest Airlines without any restrictions! Our first trip using this companion pass was a get away to Park City, Utah during MLK Weekend. We both had Monday off for the holiday so we flew out on Saturday that weekend to Salt Lake City, Utah. 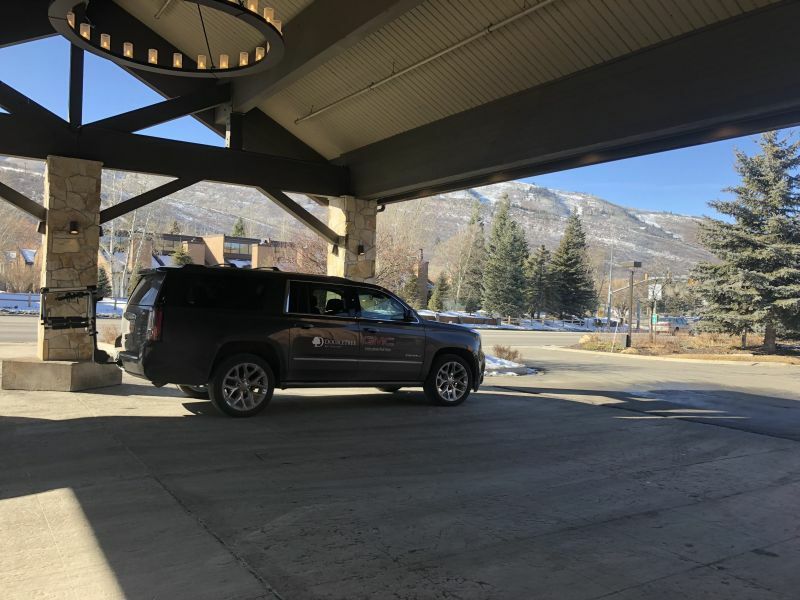 After arriving in Salt Lake City, the friendly agent at the Enterprise Car Rental Counter upgraded us to an AWD SUV even though the road conditions were great since it had not snowed in days. The drive from SLC Airport to Park City was only about thirty minutes. After getting into town, we had lunch at a really good soup, salad, and sandwich shop called Zuppa Cafe. We checked into our hotel, the Doubletree Hotel Park City - The Yarrow after our lunch. Since I was a Diamond guest, our resort fee was waived as usual. The resort fee covered the extras they provide like the evening appetizers and the complimentary car service and shuttle. 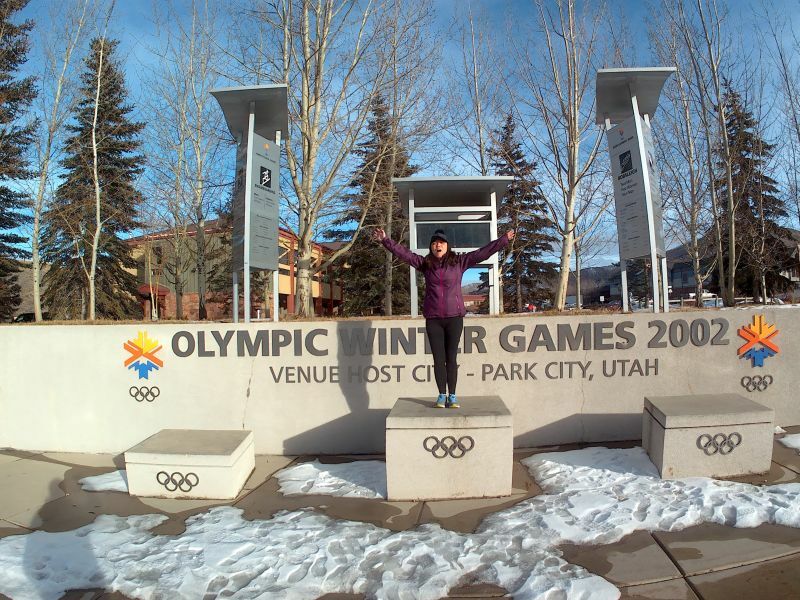 We walked across and explored a park across the street which was dedicated to the 2002 Winter Olympic Games which were held in Salt Lake City. A lot of the events were held in Park City. After enjoying some appetizers and the hot cocoa bar at the hotel, we departed via their hotel shuttle for Main Street. The historic Main Street in Park City was really cool. Park City was an old mining town before it became a premier ski destination. We walked around Main Street and explored several shops including a local coffee shop where I had to get a cup of their coffee. Afterwards, we headed over to the High West Distillery. The wait for a table was over two hours so Joy and I just went to the bar where I tried some of the whiskey they make. Afterwards, we found a local pizza and pasta place for dinner before having some great local ice cream at Java Cow! It was freezing outside however. The temperatures dipped down to around 19 degrees that night. The heated seats in the GMC car service from the hotel were a welcome treat! The next morning, we had the typical Doubletree breakfast before heading out to the White Pine Nordic Center for some cross country skiing. The tracks were pretty icy since there was a general lack of snow in the area. After a morning of trying out the trails, we headed back to the hotel to check out. The hotel gave us a late check out time of 2:00 PM since I was a Diamond guest. 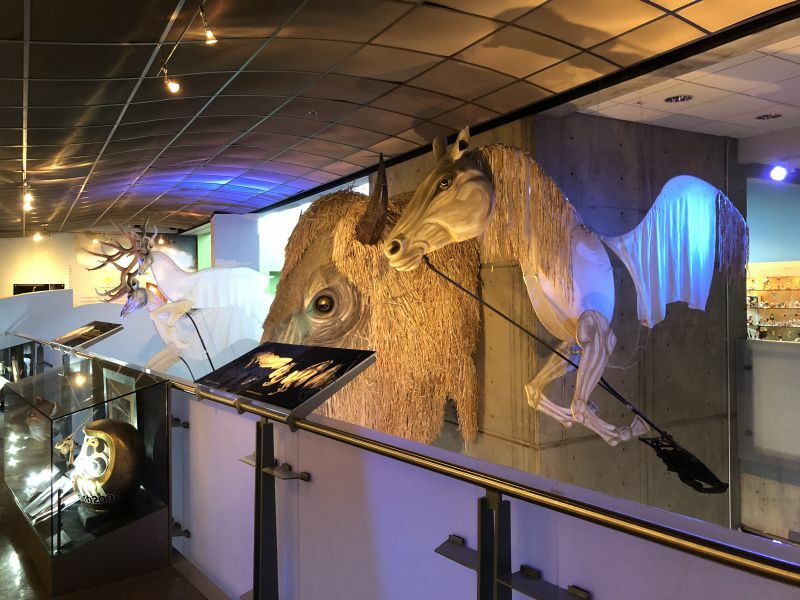 We explored the US Olympic Team Training Center and museum in Park City on the way out of town. That night, we stayed at another Hilton property near SLC Airport. This Doubletree had an Executive Lounge, but it was not open on Sunday so they gave us vouchers to get free appetizers and drinks in the restaurant and bar downstairs along with the typical Doubletree cookie. Joy and I went to Temple Square that check out the LDS Temple and other buildings there including Bee Hive House. Afterwards, we had dinner at the Rodizio Grill in Trolley Square. This Brazilian BBQ was amazing. We both enjoyed the multiple meat selections that kept coming to our table. We had our annual President's Day/Valentine's trip to Sun Valley shortly after arrivng back from Park City. From our flight from Sacramento to Boise was on Saturday, and we got into Boise around 3:00 PM. From there, we rented a car and drove to Sun Valley, Idaho. This year, we rented a condo in the Elkhorn Village area of Sun Valley. After getting our keys from the main resort office in town, we headed over to the condo to get settled in. The drive was a little tricky since it was hilly and slick. 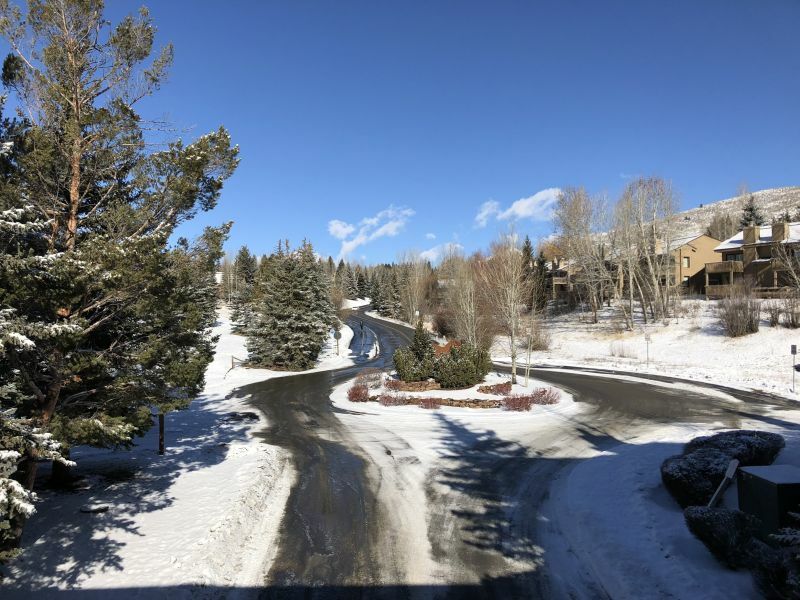 They did not have much snow this year on the ground in Sun Valley, but the roads can still be icy or slick when they get even a little snow. It did snow that afternoon and evening however. Luckily, the condo had a heated garage for the rental car. We were supposed to go to dinner at a nice restaurant in Ketchum that night, but the rental car slide a little when we were going down one of the hills after leaving the condo so we got a quick bite to eat at the ski lodge at Dollar Mountain before heading back to the warmth of the fire in the condo. The next day, we were disappointed to see that the nordic trails at the Sun Valley Club were closed due to lack of snow. So, we drove about thirty minutes north to Galena Lodge. The Galena area was higher up so they got more snow. 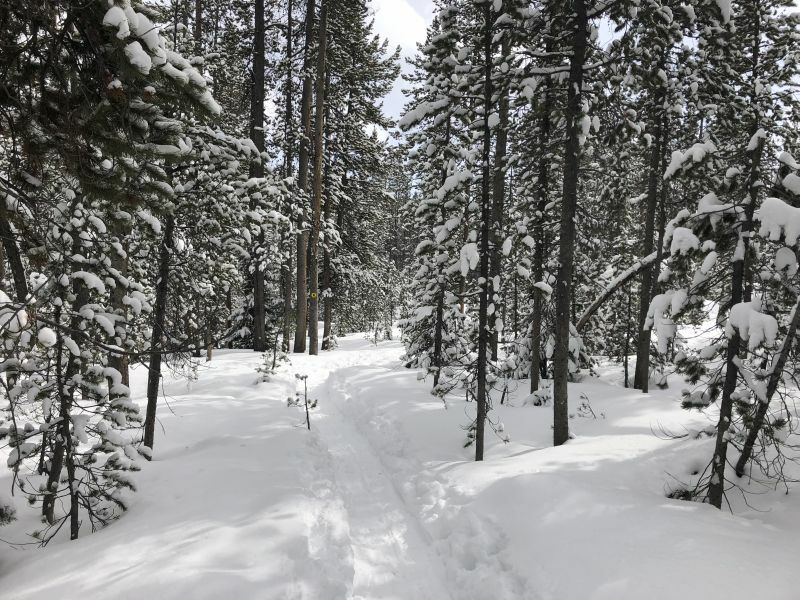 We got trail passes, and we did about a mile of snowshoeing through beautiful country. Afterwards, we returned to the Sun Valley Club for lunch. The food was great as usual. I was able to use the outdoor jacuzzi as well as the steam room at the condo community after lunch. Although it was cold outside, the jacuzzi felt nice. Joy and I enjoyed lunch at Gretchen's Restaurant at the Sun Valley Lodge on Monday. I tried some elk chili which was amazing. Afterwards, we returned to Boise where we spent the night before flying back home to Sacramento on Tuesday.